Who is Merci? Is this another one of our forays into the world of menswear? Well, it could be (as they carry men’s clothing) but that is not the case here. No, for all of the things that Merci (based in Paris) has carried (including men’s, women’s, and home goods lines), they have not really featured a watch. Now, I’m guessing that if you visited their shop, you would likely have seen some watches kicking around somewhere. But nothing that was really their own, you know? And for a self-professed watch guy, which Arthur Gerbi (you know, the CEO) is, that just could not stand. So, that brings us to today, and the Merci LMM-01. For some, this might sniff of a department store simply trying to do a quick rebrand of a fashion watch, and call it a day. From my time with the Merci LMM-01 (aka, La Montre Merci-01), though, I am fairly confident that this is not the case. Merci themselves must be feeling pretty confident as well, after the watch was spotted on the wrist of French President Emmanuel Macron. Watch-spotting on the wrists of world leaders can be entertaining, especially as one wonders how some of them may have obtained some of the more exotic options. Then, on the other hand, you have something like this watch, that is rather affordable. 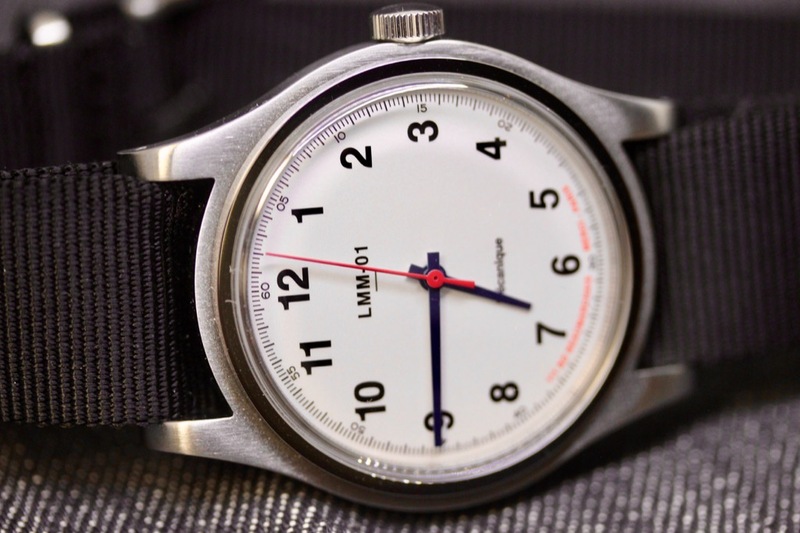 And it’s not just that the Merci LMM-01 is an affordable watch. When I opened up the box, I was struck by the elegant simplicity of the watch, while at the same time carrying an implied ruggedness to it, given it’s vintage field watch looks. In other words, this should be an excellent every-day companion. Part of this is aided by the relatively compact steel case. Coming in at a small (for this day and age) 37.5mm and under 11mm tall, this is a watch that should be at home on just about any wrist, guy or girl. What this meant, for me, is that the Merci LMM-01 acted as a true companion for the day. It melted away under a shirt cuff, popping out to do time-reminding services as needed. With it’s clean, contrasting designs (we had the white dial, but there is also a black dial version), it’s a quick read on the time, and it’s unobtrusive. It pops out, get the time, and then you tuck it back away. However, if you have a moment to actually look more closely at the watch, then you can appreciate some of the details that are hiding in plain sight. First, on the dial, you’ve got not just black and white, but also a pop of red. This is on the seconds hand, and then down on the printing on the lower portion of the dial. While other brands would use this ink to trumpet the Swiss-made nature of the watch (and the Merci LMM-01 is, make no mistake), it instead proclaims information about the brand (specifically, their address). The details I want to call your attention to on the Merci LMM-01 is the case. Looking at things straight on, it might seem like just another bezel-less field-watch look – and to some extent, yeah, you would not be wrong. When you start tilting things a bit, though, you realize that the top of the case is reflecting light differently. Part of that is from the tall Perspex crystal, but it’s more from the fact that the bezel surrounding the crystal is polished, top and sides. So, you’ve got this very reflective piece surrounding the crystal, giving you that little touch of flash to things. When viewed in a total profile, it picks up the polished bits on the caseback, and makes this tidy little sandwich – or macaroon, perhaps – of alternating finishes. Yeah, I am a fan. To see the caseback, you’ll need to pull the included NATO-style strap out of the way. The caseback is fairly simple and plain, and carries the Swiss-made notifier. What really struck me when I pulled the strap off was the fact that Merci included quick-change spring bars, even on this strap. This is a nice nod to ease of use for the customer, particularly as this sort of watch would play very nicely with strap changes (and their site shows some other rather nice options). As you might suspect, I had a great deal of fun wearing this watch (if you don’t believe me, check out my Instagram feed). It was an effortless companion, and it’s a bit of a mind shift to remember that, yeah, the ETA 2801-2 movement needs to be manually wound. It just serves to reinforce the vintage feel of the watch, as well as underscoring, again, the elegant simplicity of the watch. By going with a manual, it kept a slimmer profile (frankly, the bulk an automatic would need seems like it would totally throw off the proportions of the watch). With a few different strap choices in the mix, the Merci LMM-01 certainly could be an all-day, every day sort of a watch. Would I wear it? Oui! The best thing about it: The whole thing. This watch just really connected with me.